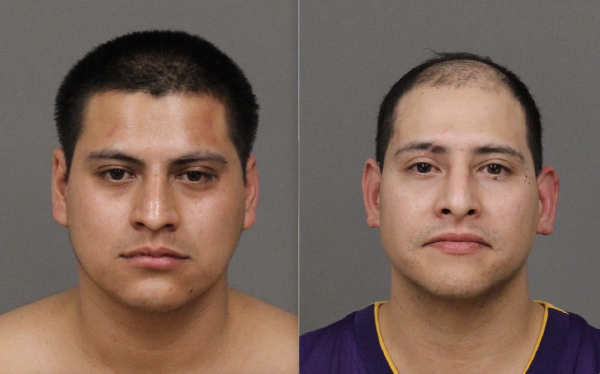 Two men who were allegedly drunk in public on St. Patrick’s Day fought San Luis Obispo police officers, knocking one of the policemen unconscious, according to police. On Sunday, three San Luis Obispo men got into a verbal argument with staff at a bar in the 700 block of Higuera Street. Shortly afterwards, officers arrested one of the men for being drunk in public, and the other two suspects began fighting with officers, police said. While struggling to place the two outstanding suspects in handcuffs, one of the officers was knocked unconscious. Responders transported the officer to the hospital, where he was treated and released. The injured officer is expected to fully recover. Police arrested David Delgado Jasso for assault on a police officer and being drunk in public. Jose Jasso, the other suspect who fought with officers, was arrested for resisting a police officer, violating probation, being drunk in public and possession of a controlled substance. The third man whom police initially arrested was only charged with being drunk in public. Police say he cooperated with officers. In all, San Luis Obispo police made 24 arrests during St. Patrick’s Day weekend, a sharp decrease from a total of 40 arrests during the holiday in 2018. Fourteen of the 24 arrests were for public intoxication, while three were for DUI, one was for false identification and four were for miscellaneous charges. The overwhelming majority of community members, particularly students, made smart and responsible decisions on St. Patrick’s Day, police said. Police beefed up patrols during the festivities over the weekend in order to monitor celebrations and keep the community safe. This report is inaccurate! These brothers and 3 others, some with facial tatoo’s, caused a huge bar fight and were subdued and thrown out after a 3 minute brawl in a completely packed bar. The police were called after they were out and that is when the arrest and knock out happened. They also reportedly pulled a knife on someone before the police arrived. I decided to do some digging and these same brothers were involved in an attack back in April of 2018. A man was attacked by these two brothers and a third man. When the police were called they fled but came back and attacked the man again after police left. The man defended himself with a knife and both brothers went to hospital and were arrested. These are violent men. They need to be prosecuted to the fullest extent of the law. Does anyone have any information on whether or not they are still being held? Pretty pathetic that with all that “training,” pepper spray, tasers etc that one still manages to get ko’d by a couple of drunk idiots. Worth 90k+ a year each in salary? I heard from some SLOPD officers that the D.A.s office has refused to file charges on the guys who knocked out the officer. That kind of support from our limp d*ck DA is really going to make police officers want to get out there and do their jobs. Dan Dow: Profile in Courage? Californians that voted for props 47, 57 and Gov Brown are weak AND stupid on crime. Seems like you have to kill someone now to spend time in state prison. Jerry and his lackies emptied all the state prisons because not everyone had their own bed room, TV and personnel space (constitutionally required according to some left wing kook judge). Now Newsome completely reversed his hands off death penalty position he made two years ago where he said he would cede to the will of the voters; hey Newsome, the voters voted DOWN abolishing the death penalty and they voted for an expedited process for death row cases. Newsome is not truthful or representative of the people! I agree with RU Kidding! It is a fact that liberals are weak-on-crime, and they also support open borders, amnesty and sanctuary city policies, so I think we all have to realize that there IS a connection between incidents like what happened in this case and the broader issues we see at play. God Bless the police officer, pray for a speedy recovery. God D___ the criminals, pray for a long sentence! These 2 jerks ought to be lucky to still be standing if they knocked a police officer out. I can’t even imagine what the headlines would be, from the liberals and the sanctuary supporters, if the table had been turned and one of these guys or both had been knocked unconscious. They would want them all fired, violated their rights, abuse of power and obviously some type of racial conflict. I think SLO is going from the nicest place to the mostest bar place around. These two drunks don’t have anything to do with ” liberals and the sanctuary supporters,”. The laws and the lack of enforcement of these laws applies to everyone. The sanctuary aspect is just part of the affect to let criminals roam our streets. These are the sole actions of liberals. My comment referred to “what if” and I still wonder “what if” as more and more people will become victims of crime, which are committed by everyone as I’m not going to get sucked into a racial aspect as an excuse for anyone breaking the law. And yes, I am prejudice against those that break the law just as you may be towards the people that broke the law and falsely accused you and Karen to which you had to pay dearly. Enough with hypotheticals. What if aliens sucked out your brain?